The Rt Rev. 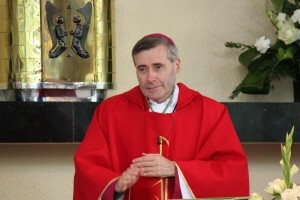 Mark Davies, the Bishop of Shrewsbury, has encouraged Catholics to take a “personal stand of faith” at a time when changes in the atmosphere of British society may indicate “a gathering storm for believers”. Preaching on the August 30th feast day of St Margaret Clitheroe, St Margaret Ward and St Anne Line – three women who died as martyrs during the Reformation – Bishop Davies said that many Christians were observing growing hostility to the public profession of faith in the British society. Proposed legislation to redefine marriage, in particular, is likely to bring new legal threats that will test the consciences of Christians, he said in a homily at a Mass celebrated jointly for the Catholic Women’s League and the Union of Catholic Mothers at St Columba’s Church, Chester. But Bishop Davies said that during the Year of Faith, which Pope Benedict XVI will open on October 11, he would be encouraging every parish in his diocese to “consider a public act of witness to the faith we share within their own circumstances and locality”. The Bishop added that it was in the example of the English martyrs that today “we each recognise the need for that personal stand of faith amidst the gathering storms of our life-time”. Bishop Davies said: “In the gentle reign of Queen Elizabeth II Christians have been threatened in their employment or even brought before courts for their witness and the Church’s social care agencies have been closed down by legislation which recognises no place for the Christian conscience. “The determination of the present Coalition Government to legally re-define marriage may soon present new questions of conscience and legal threats to those who continue to profess the truth about marriage as the lasting union of one man and one woman.